Ms. Coates and her husband had enrolled their two older children in private Catholic school, but that eventually became a financial impossibility. Instead of moving out of Bridgeport, where most schools in the city were rated far lower than those in surrounding areas, she decided to tackle the situation head on. Ms. Coates showed up at a Bridgeport Board of Education meeting, where she witnessed parents at odds with each other and a system that was not working for her kids. Next stop was the state capitol where, with her baby in her arms, Ms. Coates testified at a hearing in support of public charter schools – testimony that helped influence the legislative decision to support opening two new charter schools in Bridgeport. 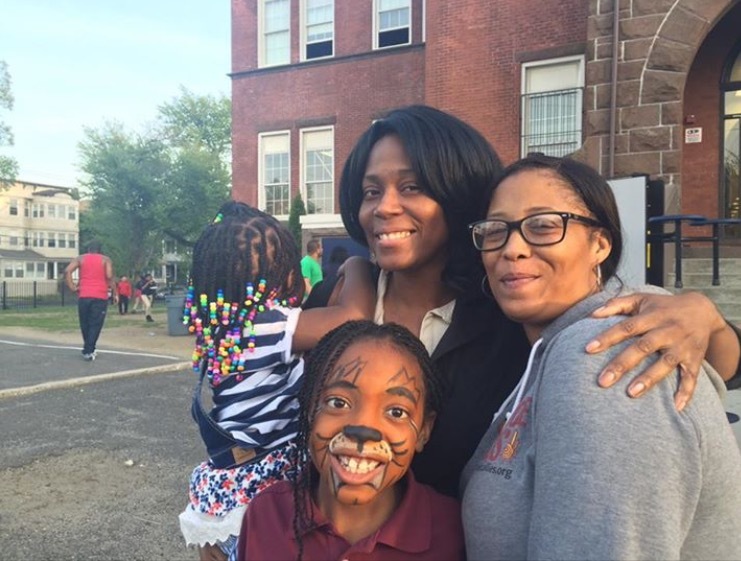 While her son was selected through the blind lottery to attend Achievement First Bridgeport Academy Middle School (AFBA), even with sibling preference her daughter ended up on the waiting list for AFBA Elementary School. And she wasn’t alone. This encouraged Ms. Coates to become even more determined to enact change. She ran for a seat on the Bridgeport Board of Education – and won. Not surprisingly, her views on school choice weren’t very popular with her fellow BOE members. In spite of her detractors, Ms. Coates said she is glad to have “stepped out of my comfort zone” to shed light on the subject. She said many people were interested and open-minded, and as difficult as it was for her, she doesn’t regret getting a little beat up during her BOE tenure. Ms. Dumas said that Ms. Coates’ “limitless motivation” stems in part from something she learned while serving on the Bridgeport Board of Education: one of the factors used to determine the number of prisons built is based on the reading levels of 3rd graders in urban areas. The seed of activism was sown at a young age. As a child, she and her younger brother lived in a well-to-do area of Westchester County, where public schools were well-funded and students received a quality education. When the family relocated to an area of Connecticut where the schools weren’t on par, Ms. Coates noticed a dramatic shift in her brother that was troubling. Experiencing the two extreme educational environments and the impact on her brother was an eye-opener. Fast forward to today, where this mother of three fights for the right for all children to have access to a quality education – regardless of their zip code. In fact, she believes that receiving a quality education is a civil right. And the upside, she said, is that you come through them with something to offer others.